For nearly as long as I’ve owned cell phones, I’ve carried them in my pocket, sans case, and I figured that when I got my spiffy new iPhone 3G, I’d probably do the same thing. The new phone would be slimmer than my old one, making it more pocketable, and I’d never had any particular problems with scratches or other damage (as long as I remembered not to put coins, keys, or other hard objects in the same pocket as the phone). However, as soon as I began using my new iPhone, I realized that the glossy plastic case provides very little grip. If my hands are at all sweaty, the device feels worryingly slick. I found myself feeling anxious about pulling the phone out of my pocket on a crowded subway platform or sidewalk, because it would be so easy to drop. And, of course, even if the phone kept working thereafter, its beautiful shiny surface would be marred. In the first couple of weeks after the iPhone 3G’s launch, only a few case options were available (and of those, still fewer were available here in France), and though I fully expect that number to climb into the triple digits before long, I had to work with what I could find. My major desire was for something to provide traction, and secondarily, to cushion the phone slightly in the event that it did fall. I won’t wear a cell phone clipped to my belt or otherwise visible on my person, and I don’t like having to perform an additional procedure of opening a case or removing a phone before I can use it. So holsters, sleeves, wallets, and other such designs were out – I was looking for a simple, slim case with a decent texture. PixelSkin — The first case I tried was the PixelSkin from Speck Products. This is a rubbery one-piece case that slips onto the phone easily and allows ready access to the controls, ports, and camera lens. (The case feels like it’s made of silicone, but the manufacturer doesn’t say what the material is.) Because of the case’s texture and chunky surface, my anxiety about dropping the phone magically went away – an immediate plus. I also appreciated that it came in purple, my favorite color (as well as five other colors), and putting the case on the phone was as easy as could be. After using the PixelSkin for about a week, though, I realized that my criteria for choosing a case had left out a few important facts. For one thing, I hadn’t considered the ease of getting the phone into and out of my pocket. As fantastic as the PixelSkin was at being “grippy,” that also meant that I couldn’t get it out of my pocket in a hurry without turning the pocket inside-out. So for me, a texture that didn’t adhere quite so well to its surroundings would have been a better choice. Also, although the PixelSkin was plenty thick and cushiony (a good thing safety-wise), that made my slim new phone about as thick as my old one had been, a minus in my book. In addition, the case’s raised lip around the screen, which might have protected it if the phone fell, sometimes interfered with tapping or dragging right near the screen’s edge. And finally, I prefer to use a dock when syncing and charging my iPhone, and the PixelSkin’s case had to be removed every time I docked the phone. Elan Form — So my revised selection criteria included thinness, a less-tacky surface, better access to screen edges, and dockability. That turns out to be a rather tall order for an iPhone case, but I found one particularly promising candidate: the Griffin Elan Form. 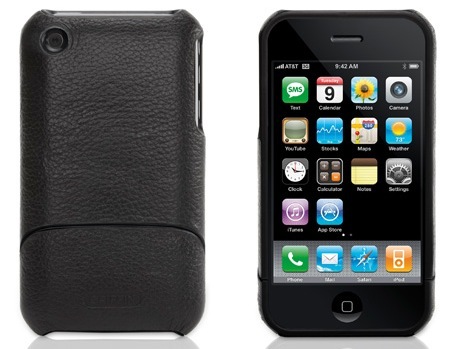 It’s a thin, two-piece polycarbonate shell covered with leather. (It comes in pink with brown trim, and in black.) The large, top piece slides on the phone and stays there; a smaller bottom piece pops off to enable the phone to dock. Griffin also includes a screen shield made of heavy transparent plastic. It took a bit of oomph to get the case on the phone, as the fit is quite snug. The first few times I removed the bottom piece to dock the phone took a bit of finessing too; but now it stays on nicely when I want it to be on, yet comes off without a struggle. The textured leather provides a nice solid grip on the phone without the stickiness or bulk of the PixelSkin; it also slips into and out of my pocket easily. Because the lip around the screen is much smaller, access to the edges of the screen is no problem. And, of course, I can now dock the phone without removing the entire case, though I do have to slip off the bottom piece, which could then potentially be lost. I’m not sure it’s a huge improvement to remove only part of the case rather than the whole thing to dock the phone, but it seems somewhat easier to me. One small complaint: after a few weeks of use, the leather began pulling away from the plastic shell in one corner. I’m sure I could glue it back into place, but I shouldn’t have to be making repairs, however minor, on something I just bought. Using the Elan Form made me realize there was yet another deficiency in my selection criteria: I hadn’t taken the screen into account. I wasn’t especially worried about scratching the glass screen, but all the same, I figured it couldn’t hurt to pop in the Elan Form’s screen shield. Unfortunately, this piece of plastic is a real blemish on the case’s overall design. Thankfully, the shield doesn’t adversely affect the screen’s touch sensitivity. But it’s a thick piece of plastic that’s not perfectly rigid and as such, it doesn’t make complete contact with the entire screen. Even if you scrupulously avoid moisture or grease on the screen or the cover, the parts of the shield that come in contact with the screen will have a blotchy, amoeba-like appearance, which is both unsightly and distracting. Years ago when I had a Palm, I bought screen protectors, and I remembered how tricky it was to apply them without getting any air bubbles or dust particles between the protector and the screen. So I took extraordinary precautions to work in as dust-free an environment as I could and to clean the phone thoroughly. Then I applied and removed the adhesive sheet Power Support includes for last-second dust removal and applied the screen protector as carefully as I could. On the plus side: I was able to apply the film with no dust or bubbles. Unfortunately, I didn’t realize until it was too late that it was very slightly crooked; the alignment turned out to be much more of a challenge than anything else. More irritating, though, was the fact that even though this Crystal Skin model was expressly designed for the iPhone 3G, it doesn’t quite cover the screen – there’s a gap of about 1 mm all the way around. And because the Elan Form comes just to the edge of the screen in the front (a good thing), it leaves the edges of the Crystal Film exposed, so I’m constantly reminded that it’s there (and that I didn’t get it on perfectly straight). Apart from that, the Crystal Film works as promised. It feels and acts just like the original glass, and collects grease and fingerprints with equal ease. That’s all fine with me, though, because the main thing is that I don’t worry about minor scratches or dings on the screen and the display isn’t impaired in any way. Inching Toward Perfection — Now that I’ve gone through two cases and a screen protector, I’ve finally come to understand what I actually want in an iPhone case, though finding the model that suits me perfectly will undoubtedly require more trial and error. I want something that will interfere as little as possible with my normal use of the phone – pocketing it, docking it, and interacting with it – while providing a good grip and protection against scratches and other minor damage, preferably for the whole phone. 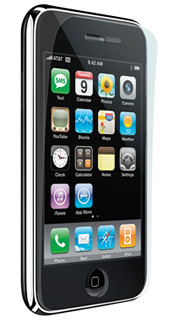 ZAGG invisibleSHIELD: It’s like a stick-on screen protector, but the two pieces wrap around the entire phone. It claims to improve the grip, though I wonder how well it will stay on, and whether I’d be nervous that it provides essentially no impact protection. 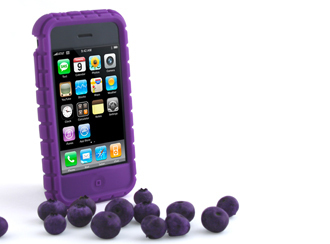 Speck Products’ SeeThru: These cases are similar in design to the Elan Form, including the slip-off bottom piece for docking, but are transparent (in your choice of colors – again, happily, purple is an option). Unlike other hard plastic cases with docking support (such as the Incase Slider Case and the Contour Flick), these have non-slip strips on the side. And, as a bonus, the removable bottom section doubles as a stand that holds your iPhone in landscape orientation. I’m sure there are other suitable options too, or will be in the near future. Of course, I’d prefer not to spend as much money on cases as on my calling plan, so the case of my dreams better come along soon!